While we are waiting for the next photo exhibition next week, here at Gemini we take great pleasure featuring other kinds of photoplay! Yes, for our Friday night, Gemini is gonna take you to the movies again! For a very special double feature! 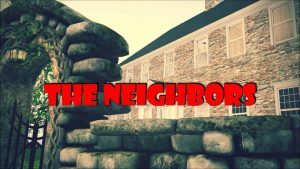 Today we are screening The Kitchen and The Neighbors by Carly & Dillon! Two movies meant to be seen in unison, shot by a wonderful couple: they are so cute that they’d be sickeningly sweet if they weren’t also a lot of fun to be with! Dillon and Carly both have a great sense of humor and don’t take themselves and their role as the most prolific and awarded ‘pornstars couple’ seriously. In the past they already did a fun challenge, choosing a set together, and shooting there a video, each their own way. The result, “The Manly Way” and “The Girly Way”, is a creation absolutely unique in the world of adult machinima, and that can’t quite replicated…except of course from them, again, a couple years later! Starring themselves, Dillon Lecker’s “The Neighbors” and Carly Mode’s “The Kitchen” are both set at the same estate, with Alexandria Topax and Katina Cazalet playing 2 different sets of supporting characters. We are going to party today, earlier than usual, starting after 7 PM SLT with the tunes of the lovely Zuby Gloom : If you haven’t visited her exhibition yet, this is the last week to do so!